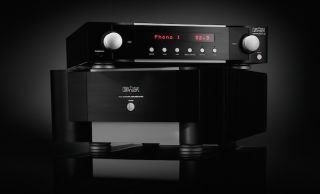 Mark Levinson expands UK amp range with No 523 and No 534 | What Hi-Fi? The No 523 preamp features a Class-A phono stage, originally developed for the company’s No 526 preamp, and also includes four gain settings and an infrasonic filter. Settings and filter are adjustable via the preamplifier’s front panel or metal remote control. Mark Levinson has also chosen a balanced R-2R Ladder volume control instead of an analogue potentiometer for, it claims, improved accuracy and transient response. It offers six analogue inputs: two balanced XLRs, three RCAs and a phono input. As for outputs, there are both balanced XLR and RCA varieties. And for the first time in a Mark Levinson amplifier, there's a 6.3mm headphone output on the front panel. The No 534 dual-mono power amp delivers 250 watts per channel into 8 ohms and features Mark Levinson’s proprietary Pure Path circuit design, in which the electrical components have been carefully chosen and arranged for their consistent, stable and low-noise qualities. The No 523 and No 534, which are both housed in a cold-rolled steel and aluminium chassis, will arrive in the UK in October and are priced £16,000 and £21,000 respectively.